The die cast aluminum housing and separate pour kit allow for easy installation into virtually any surface. 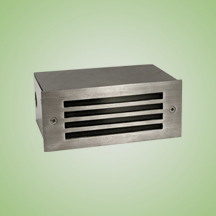 Both the louvered and open faceplates are constructed of cast aluminum and the grill faceplate is made of stainless steel. The fixture is finished with a Super Durable Powdercoat Paint with a UV inhibitor to make it impervious to atmospheric elements. The step lights are available with the choice of horizontal louvers or an open faceplate in a black finish, or a stainless steel grill. All fixtures come with a frosted glass lens. A 2.5 watt DC base LED lamp produces approximately 223 Lumens of Warm White light in the Small model while two 2.5 watt DC base LED lamps produces approximately 446 Lumens of Warm White light in the Medium model. A low voltage power supply is required to power the integral LED driver. Stainless steel hardware included. Made for recessed mounting in virtually any surface. Concrete pour kit is available. Suitable for wet locations.